and won’t be able to vote again. During polling, surrounding colors will change periodically. You can see all four choices under consideration below. Additionally, over 100 opinions were provided on Facebook, by e-mail (use poker1@caro.com), and in comments below various Poker1 entries. Why is there not a full color choice in the poll? I made the decision when this new Poker1 was launched for beta testing that flashy color wouldn’t be appropriate. My plan is to let the content take center stage. Having a large number of colors isn’t in keeping with that vision, although I’ve seen many quality sites with color splashing everywhere. I like those, too — depending on the purpose. 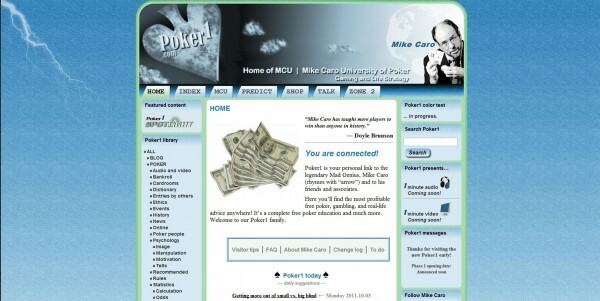 I want Poker1 to remain a quiet rest stop for learning, research, entertainment, and more. There will be plenty of color, but it will thrive in photos, illustrations, videos, and wherever it’s needed. We want to keep the surroundings relaxing.